Want to take your existing Magic: The Gathering collection and turn them into a tier-one competitive deck? 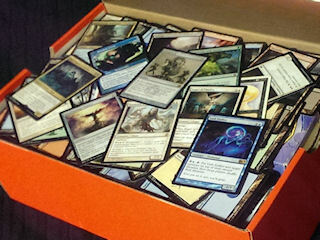 Shoebox MTG is a tool to help you do exactly that! You'll get a list of decks that you can build, based on the cards you already own. Sounds great. But isn't entering my whole collection tedious? New to the game? Is most of your collection just from a preconstructed Event Deck, Intro Deck or similar? Just use the precon import tool to select the preconstructed products you own and have the cards they contain automatically added to your Shoebox inventory. The Format Staples Wizard will walk you through the format you'd most like to play and ask you how many of each card you own from most to least valuable. This is the fastest way to start and get meaningful matches quickly (2 Dark Confidants are worth far more than 4 Lightning Bolts and 4 Boros Charms for matching you to Modern decks). Are you a Deckbox.org user? You can import your entire collection from Deckbox.org with just two clicks. Or, if you use a different system, the import tool will allow you to copy and paste your collection in plain text format. If you're a completionist and want to have the absolute best possible matches, you can manually administer your inventory card by card in the Shoebox collection manager.